Catholic Schools Week is always an opportune time to celebrate everything we love about our school and our faith. One of the ways we do that at St. Didacus Parish School is by showing gratitude to those who are such a big part of our lives: the parents of our students. Each year, we start the week off by honoring those who have entrusted their children to our care each day. And this past Monday, we did just that. 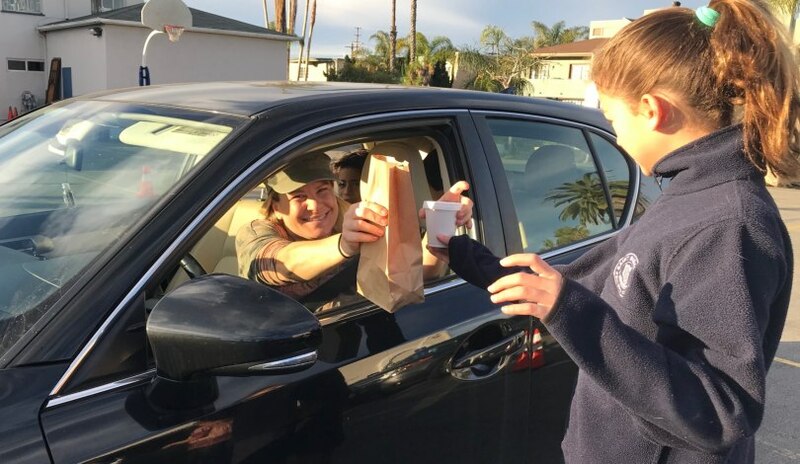 The first thing the St. Didacus parents saw when they drove through the drop-off area was members of the Student Council, who were standing by to greet them with a cup of hot coffee and a donut. Other students were also there with cream, sugar, stirring sticks, and napkins, all wrapped nicely in a paper bag – quite a nice treat on a cold January morning! The parents’ reactions ranged from surprise to sheer delight, and some even shed a few tears of joy at the sight of the young students making a relatively small, but very meaningful, gesture of thanks. The students had also prepared messages to their own parents, which they brought home to them on Monday after school. In the notes, the students expressed their gratitude to their parents for having provided them with a Catholic education at St. Didacus School, recognizing the sacrifices many of them had to make to give them that education. The older students composed letters themselves, while those in the younger grades drew pictures, made cards, and, some with the help of their teachers, wrote words of thanks. To round off the day of celebration for parents, each student was given a night of no homework. While this may sound more like a benefit to the student than the parents, anyone who has had a child in elementary school knows that parents often play a very large role when it comes to homework. They have to make sure it’s done, they often must help them with any problems they’re having, and some time has to be set aside for the child to finish each assignment. With a night of no homework, parents are free to spend family time with their child or children, free (at least for one night) from the cares of school assignments. There are many people who work hard to make St. Didacus Parish School the wonderful place that it is. But more than anyone else, it’s the parents of our students who act as the true linchpin, connecting family life with school life. Thanks to the help and support that our parents bring, we can truly call ourselves a community at St. Didacus.